An elephant also doesn’t stick to the roof of a house – he just comes crashing on through, assuming you could get the creature 15 or more feet off the ground in the first place. 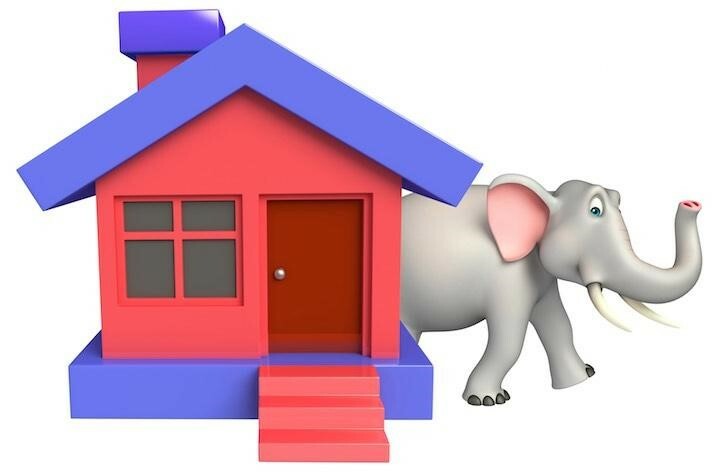 While an elephant on the roof certainly would be a big problem, there are many other more likely perils that await a roof undergoing repair, replacement, or installation. There’s rain, wind, snow, sleet, hail, ice, falling trees, clogged gutters- you name it. With enough time, even the sunlight can crack a home’s canopy. Professional roofers are familiar with these threats and more, and they know how to fix a roof so it’s right as rain, so to speak. But sometimes even professionals get caught off guard, like when a storm suddenly appears in the middle of a repair project. The roof is open, and the inside of the house gets soaked. Watch out for that one; it’s one of the most insidious. When you get the policy, and read the fine print on the cut-rate bill of goods you were sold, you’re likely to find one or more restrictions or exclusions. Some of those include, “no stand-alone roofing covered,” or “covers only incidental roofing.” If either of those exclusions take you by surprise after a claim, they’re going to hit you like an elephant just fell through the roof. So what do those two statements mean? They Mean You Might Not Be Covered! In the first instance, the insurance company will not cover you if the only service you provide is roofing. You would have to go to the client’s location for a covered service, such as drywall hanging, or carpentry, for example. Then your roofer’s insurance might cover a job up on top – if, in the insurance company’s view, roof repair was not the sole or principal reason you went out to the house. How will the insurer know? It really comes down to common sense. If you install a new set of kitchen cabinets for $2,000 and fix a tiny hole in the roof for $200, then you’re fine. But if your roofing repairs amount to $2,000 or more, the insurance company might well deny coverage should an accident occur. In the second case, you are allowed to do minor roof repair in conjunction with a non-roofing job you went out there to do. Again, we’ll use the carpentry example. You go out for a $2,000 carpentry job, and while you’re there, the homeowner asks if you can plug up a tiny leak he has in his roof. So, you climb on up, patch a hole the size of a worn-out dime, and that’s it. That’s incidental roofing. Before you take any cut-rate deals, ask for a list of exclusions. If you have any questions, have your agent explain them or contact the insurance company directly. They won’t sell directly to you in most cases, but they will help you understand what’s covered and what isn’t. You can also post your questions directly in the comments and you’ll get a good, informative reply from a pro. We’re also happy to take questions by phone about insurance in general or specific questions about a quote you might already have. That number, in case you are curious, is (866) 225-1950. We’ve been experts in this field since 2003, serving contractors, builders, and construction companies across the United States, and we’re here to help.